"Fall comfort food at its best. Garnish with fresh homemade croutons and bacon." Heat olive oil in a large pot over high heat. Cook and stir squash in hot oil until completely browned, about 10 minutes. Stir onion, butter, sea salt, and cracked white pepper into the squash; cook and stir together until the onions are completely tender and beginning to brown, about 10 minutes. Pour chicken broth and honey over the mixture; bring to a boil, reduce heat to medium-low, and cook at a simmer until the squash is tender, about 5 minutes. Pour the mixture into a blender no more than half full. Cover and hold lid in place; pulse a few times before leaving on to blend. 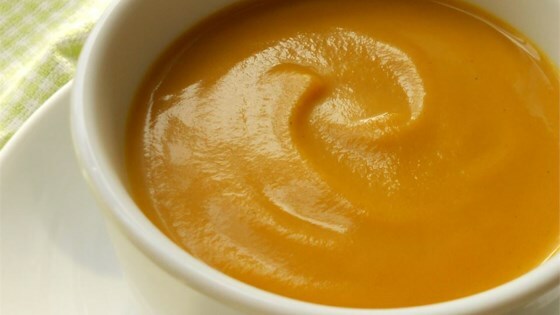 Puree in batches until smooth. Stir cream, nutmeg, salt, and ground white pepper into the soup to serve. The flavor was good, but the consistency was that comparative to baby food. Creamy, great texture, the hardest part was cutting the squash!! This was so good and so easy to make! I didn't even add cream. Flavor was great. Amazingly good! I used just a hint of milk instead of cream and it was perfect! Very tasty! Reduced the cream by a little bit, but left everything else the same. Thanks for sharing!